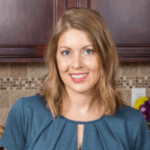 Published: May 10, 2016 · Modified: Apr 12, 2019 · By Jen Sobjack · This post may contain affiliate links. 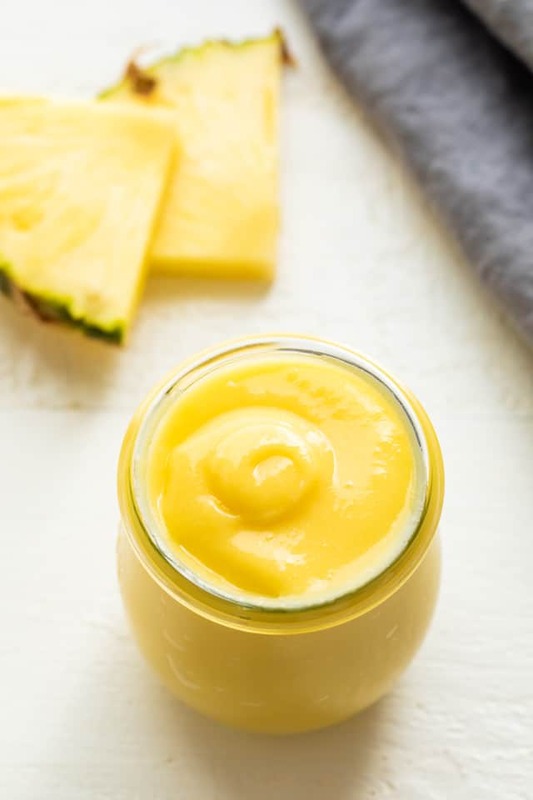 This homemade Pineapple Curd is sweet, creamy, and so easy to make. It takes just a few minutes to whip up this bright, tangy filling. This bright and buttery pineapple curd is a delicious filling for cakes, cupcakes, sweet rolls, and tarts. You’ll be happy you made this once you give it a try! I have so many spring favorites. One of them being pineapple. I could eat it every day as long as it’s sweet and juicy! It really doesn’t get much better than fresh ripe fruit. Except for turning the juice of said fruit into a rich, decadent curd! Oh yeah, I went there and I have no regrets. Try it in my pineapple coconut cake or use it in pineapple sweet rolls. I honestly have never even had pineapple curd before now. 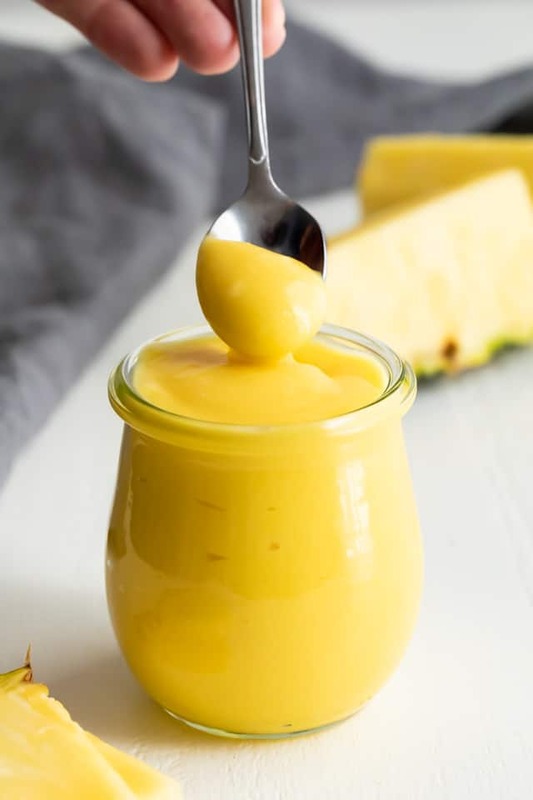 I came up with the idea after testing recipes that required pineapple filling and decided to go ahead and make my own version of this sweet, tropical curd. The process for the curd couldn’t be simpler. It’s exactly the same as making lemon curd. All you do is combine all the ingredients in a medium saucepan with a heavy bottom and cook it until becomes thick. It’s too easy. You have no excuse not to make it! You may be tempted to just devour it with a spoon but try to resist. Save it to spread between cake layers, fill cupcakes, or use as a filling for sweet rolls. Ingredients for homemade pineapple curd? You only need a handful of ingredients to make this tropical curd. And you probably already have most of them on hand. The eggs and pineapple juice make up the base of the curd while the sugar sweetens it, and the cornstarch will help thicken it. It is said that there are enzymes in pineapple that prevent it from thickening but I’ve had great results with using cornstarch. I will say that the curd will not be quite as thick as lemon curd. It’s more like a soft pudding. 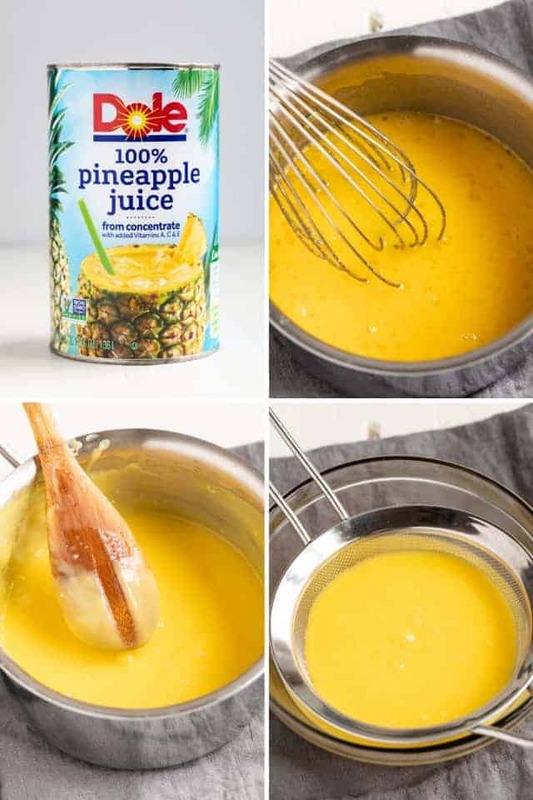 How to make pineapple curd? Combine all the ingredients into a saucepan and whisk it together. Cook over medium-low heat while whisking continuously until the curd is as thick as warm pudding. It should coat the back of a spoon and won’t run if you swipe your finger down the middle. Press the curd through a fine-mesh sieve to remove any bits of scrambled eggs. Cover the curd with plastic wrap and refrigerate for at least 2 hours. The curd will keep for up to 10 days if you keep it stored in the refrigerator. Pineapple carrot cake – Slather curd in the middle of the cake layers. But first, pipe a dam of frosting around the edge to prevent the curd from oozing out. Pineapple cupcakes – Cut the middle out of the cupcakes and fill it with pineapple curd. This would enhance the pineapple flavor of the cupcakes! Pineapple coconut muffins – Slather the curd over warm muffins and enjoy them for breakfast. 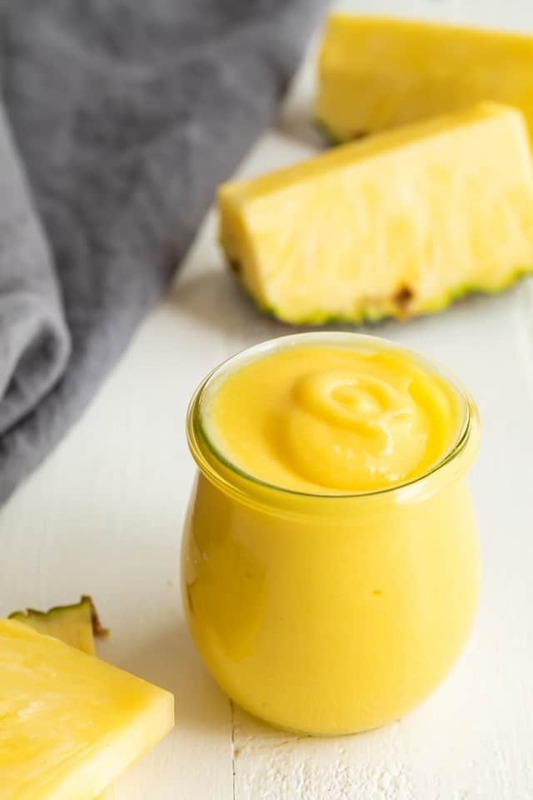 This homemade Pineapple Curd is sweet, creamy, and so easy to make. It takes just a few minutes to whip up this bright, tangy filling. This bright and buttery pineapple curd is a delicious filling for cakes, cupcakes, sweet rolls, and tarts. You’ll be happy you made this once you give it a try! 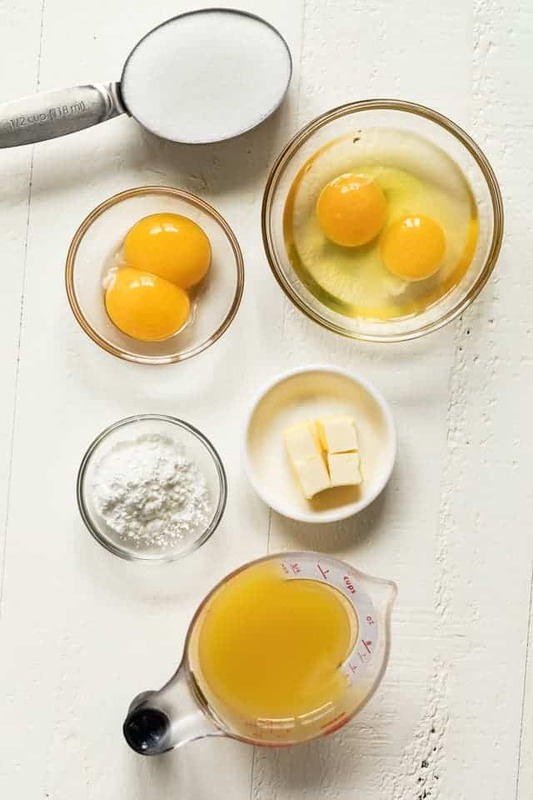 Add the eggs, egg yolks, pineapple juice, sugar, and cornstarch in a large bowl. Whisk together until well combined and cornstarch is fully dissolved. *Be sure to use canned pineapple juice. Fresh pineapple juice will not thicken properly because it contains bromelain which inhibits thickening. This enzyme is destroyed during the canning process which is why canned juice will work best for making curd. **Don’t leave out the cornstarch. The curd will not thicken properly without it. This recipe yields 1 and 1/2 cups of curd. This recipe was originally published May 10, 2016. It has been updated with new photos plus an updated recipe for better results. My daughter made this and I was only allowed a teaspoon as I am diabetic. If I could have wrestled the jar out of her hands I would have run out the door and sucked that jar dry. OMG. Silky doesn’t even come near the magic of this nectar. It takes like heaven exploded in your mouth. I will be thinking of this pineapple curd forever. Thank you. Thank you! It’s always a hit around my house too! Made this and it came out very chalky tasting. Any idea what I did wrong? Just like flour, it must be cooked long enough to remove the taste. First, make sure you fully dissolve the cornstarch in the wet ingredients before adding any heat. Then cook the curd slowly over medium-low heat. It should cook for about 10 minutes with constant stirring. If your curd thickens too quickly, it will not have had enough time to cook out the cornstarch flavor. Mine turned out chalky, did I do something wrong? It’s a great curd. Enjoy!! Can this be made with crushed pineapple? I would stick with straight juice for making curd. I made the pineapple curd and it was so good. Thanks. I had a problem on the first try of making the curd. I had to learn the different between simmering and boiling water. I will made this curd again using fresh pineapple juice instead of canned pineapple juice. love it. PS. The cake was so Moist and Delicious. Thank you so much for sharing your experience! I’m happy to hear you loved the recipe!! Like the Pillsbury Pineapple Supreme bundt cake mix the sold many years ago.? I haven’t tried baking it into a cake. I’ve only used it to fill already baked cakes. Does it require refrigeration when used as a cake filling? Yes, the curd needs to stay refrigerated even when used as a cake filling. I would keep the assembled cake in the refrigerator until it’s ready to be served. I love making curd, can’t wait to try your pineapple version! I love lime curd and Siggi’s yogurt-this would also be fabulous! I never thought of pairing it with yogurt! Genius!! This just looks so amazingly delicious! It is so, so, so good!! You certainly can. I filled my pineapple coconut cake with it! I can’t wait to try this! I’m thinking it would be great in a Tropical Trifle! Mmmmm! Thanks for the inspiration! My grandmother made something very similar, and served it over pineapple upside down cake. Talk about gilding the Lily! Mmm. Think I’ll make a cake roll with this. I’ll do a coconut cake and have a little pina colada treat. Or fill a cupake for the same effect. Using this for macaron filling! Love it! Oh wow, I am a pineapple lover and will definitely try this! One question, how did you juice the pineapple? I used canned pineapple juice. Look for 100% juice when shopping for it. Pineapple curd donuts sound fabulous! Enjoy!! Oooooo! I missed this? What a great idea. I can see myself putting this on EVERYTHING!! HOLY YUM! I am making this right now! Have to have it. This might rival lemon curd! Wow Jen, I’ve made lemon curd and blood orange curd, but never pineapple curd! What an awesome idea! I’ll be trying this recipe for sure! Thanks for sharing! You will adore it, Mary Ann! I’ve already used it in so many things!! Oh my goodness Jen, this is gorgeous and sounds amazing! I only made lemon curd for the first time a few weeks ago, but I’m a total convert so I think I need to try this one next! I think we should turn all the juicy fruits into curds! It sounds incredible Jen! 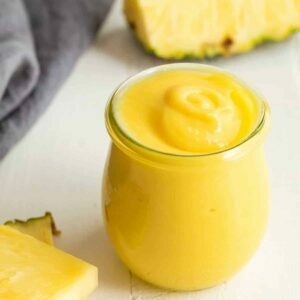 Never thought of making pineapple curd but I can imagine it must taste amazing! I need to try this! Yes! It is so good, Manali! I hope you try it. I could eat pineapple all day long too, girlfriend! And I happen to LOVE me some curd, but I have never had pineapple curd! I know- whaaaa?! I totally need to get on this, ASAP! I bet this is crazy addictive!!! Cheers, Jen! Pineapple is so GOOD! You are going to love the curd!! This is BRILLIANT. I’ve never even thought that pineapple curd could happen. Now visions of tropical desserts are swirling in my head and I can’t wait to give it a shot! It’s so tasty! I’ve already used in a couple different recipes that are scheduled to make an appearance. I LOVE this idea! I have a pineapple fruit dip that is made in a similar way, and I love the flavor! I bet this would be an awesome filling for any spring cake! Pineapple fruit dip sounds incredible! I’m sure you’d love this curd if it’s similar to the dip. Love pineapple and pineapple juice! This is such a great idea Jen! Love it! Perfect for summer! You will love it, Mira! It would be delicious on waffles! I have never ever thought to make pineapple curd – but ooohlala, the possibilities of it’s usage are endless! Thanks so much for sharing this – utter brilliance btw! Yes, there is so much you can do with it! I’ve never heard of pineapple curd before, but this stuff looks seriously amazing! I’m pretty sure I’d eat it all — with just a spoon! Pineapple curd is such a great idea, Jen! I’ve never had this before, so I’m loving this flavor. I know I could spoon this onto just about everything. So perfect for this time of year! That sounds amazing! Thank you for sharing! !